My play this week in net has been very encouraging. With playoffs coming up next week, my confidence has been climbing. Especially after some tough games that I came out ahead in this week. Malys beat the 2nd place Dragons team and secured a playoff spot in a 5-1 game. I had a strong game and stopped some good opportunities. Still, my defense came up with the first star by blocking as many shots as they did and really cutting off the passing lanes. 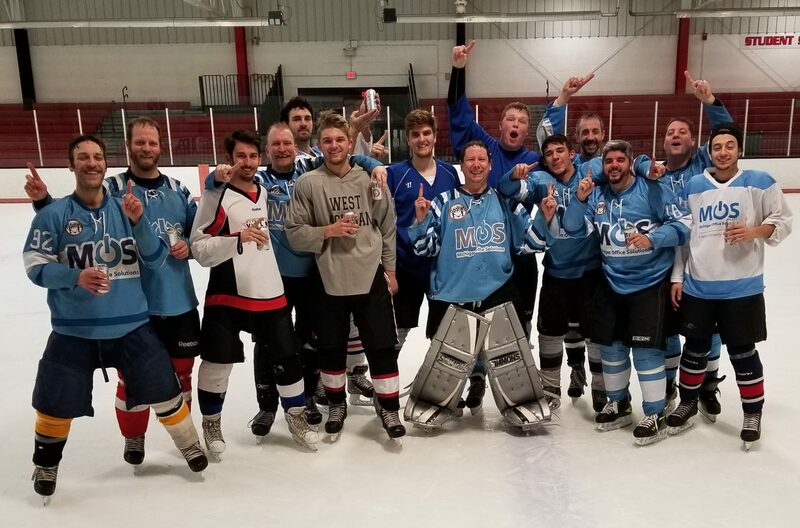 Marketlab also won their big game by a 8-2 final over Ellis Sales. This game was 3-2 going into the 3rd period, but after giving up the 4th goal, the team just collapsed. This was the same team that we barely beat in the finals last season 2-1, and they played us tough. I had two big breakaway stops and really felt confident we would win that game. Believe it or not, Structural Standards has a chance to make playoffs with a win next week. They didn’t win this week, but I also didn’t play for them. Not like it mattered since they were missing all their big guns. Lets see what happens next week. To sneak into the playoffs as the #6 seed would be an unbelievable accomplishment. One that won’t be easy to achieve. Finally, I played the last game for Action Water Sports which I have been subbing for the last month. I finished 2-2 for the season. One loss I had was a forfeit because we didn’t have enough players. The other forfeit was a 5-2 loss that I just didn’t play well in. Both wins we had were against teams that were not as skilled as us. I guess the point of me saying that is I have to play a lot better in ice hockey this summer. I really need to come up with wins against teams who are just as good if not better than us. Heading into the weekend, I am quite relaxed. Playoffs are next weekend, and I have games all week to tune me up for the playoff run. No playoff series is going to be easy. You just have to take it one game at a time and hope that the hockey gods are smiling upon you. I have had great luck in playoffs and I have to wonder when those same hockey gods are going to turn their backs on me. I just hope its not next weekend. Previous PostPrevious How do you update Twitter?